Both of our restaurants are open to hotel guests and the general public. One restaurant serves breakfast and dinner, buffet-style, to hotel guests, where you can choose from a wide variety of dishes, including fruit and vegetable salads. 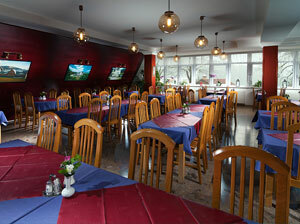 Next to the restaurant, there is a snack bar offering a large selection of refreshments, coffee, wine and mixed drinks. On the ground floor, there is a stylish restaurant Formanka that seats 100 people with an adjoining conservatory offering a wonderful view to the picturesque Giant Mountains. A wide range of Czech, regional and international cuisine is served there. A selection of domestic and international wines is available, as well as other alcoholic drinks.